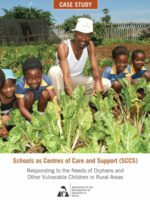 SCCS was initially was implemented in three provinces in South Africa, namely the Eastern Cape, KwaZulu-Natal and North West. The SCCS model formed the basis of the KwaZulu-Natal Department of Education’s strategy for implementing White Paper 6 on inclusive education, while the North West Department of Education is using the model to mainstream care and support at all levels within the province. From 2006 to 2008, MIET AFRICA piloted the SCCS programme in collaboration with the Ministries of Education of three SADC Member States—Swaziland, South Africa and Zambia—and in partnership with UNICEF and local NGOs. The positive post-pilot evaluation resulted in the SCCS model being adopted as the foundation for the regional Care and Support for Teaching and Learning (CSTL) Programme. Officially adopted by the SADC Ministers of Education in 2008, CSTL offers a comprehensive response to the impact of poverty and HIV&AIDS and other health-related barriers facing learners in the region. SCCS was funded by the Embassy of the Kingdom of the Netherlands.